2nd April – 6th May, Minehead Literary Festival Art Exhibition, at the Regal Theatre and Toucan Wholefoods to celebrate Minehead Literary Festival, which takes place at Minehead Methodist Hall on Saturday April 27. The art exhibition focuses on the importance of place, the theme of the literary festival, and features work by accomplished local artists Jo Minoprio, Leo Davey and Pauline Clyde, who are well known for capturing a strong sense of place in their depiction of local scenes. 6th – 25th April Dunster Castle, Cadbury Easter Egg Hunt: a rabbit’s tale, Bunny is back and this year he’s brought some friends along with him. Hear the tales of famous rabbits throughout literature, solve the clues and claim your Cadbury chocolate prize at the end, £2.50 in addition to the normal entry fee. Have a go archery and pistol shooting on selected dates (minimum ages apply). 7th April Lambing Talk at Horner Farm, meet Holly and Mark the tenant farmers and hear all about lambing time and meet the newborn lambs. An opportunity to get a peak inside the barn doors and hear tales from the farm. Meet at the farm gate in Horner National Trust car park at 12pm. 13th April Flora and Fauna of the East Lyn walk, guided walk with a National Trust Ranger and National Park representative on the history and Flora/Fauna of the East Lyn to Watersmeet, noon, booking essential on 01598 752509, £7.50 to include a cream tea. 15th April West Exmoor Webfoot Walk, a real moorland walk with some historical interest. We will start at Goat Hill Bridge and go via Pinkery Pond, Wood Barrow, Saddle Stone, Shallowford, North Furzehill, Hoaroak, Exe Head and Chains Barrow back to the start point, 10 miles. 4th, 28th & 30th May Lorna Doone Walk, a walk up the Doone valley alongside the beautiful Badgeworthy water. Visit the R.D.Blackmore memorial stone and try climbing up the infamous waterslide that John Ridd scaled to meet Lorna Doone; continue through the pages of the novel, enjoying the spectacular scenery of this remote stretch of moorland. Booking essential: 01643 831759. 17th, 18th, 19th May – Golden Horseshoe Ride, from Exford Showground, the UK’s oldest competitive endurance ride. 25th May – 2nd June Rosemoor RHS Garden, Torrington, Get set grow – garden trail: explore Rosemoor in all its late-spring glory, find fabulous flowers, enjoy creative play with free drop-in craft workshops (11am & 2pm) and spot wonderful wildlife. 29th May The Nutcombe Bottom Big Adventure, come and explore the natural world with family games and activities lasting all day. Play in the woodland, make a den and search for mini-beasts. Please wear outdoor clothing and suitable footwear. A partnership event with the Forestry Commission, 10am-4pm, free but donations welcomed for Caremoor for Exmoor. 3rd & 18th June Lorna Doone Walk, a walk up the Doone valley alongside the beautiful Badgeworthy water. Visit the R.D.Blackmore memorial stone and try climbing up the infamous waterslide that John Ridd scaled to meet Lorna Doone; continue through the pages of the novel, enjoying the spectacular scenery of this remote stretch of moorland. Booking essential: 01643 831759. 6th June, The Lorna Doone Experience, meet at Lorna Doone Farm, with its ancient packhorse bridge and crossing ford, and walk up the Doone valley through pastures alongside the beautiful Badgeworthy water. You can visit the R.D.Blackmore memorial stone and try climbing up the infamous waterslide that John Ridd scaled to meet Lorna Doone. We then continue through the pages of the novel, finding the ruined medieval village where the outlawed Doone Clan hung out, and enjoying the spectacular scenery of this remote stretch of moorland. We will likely see Exmoor ponies, now an endangered rare breed, and will have a good chance of spotting Red deer, particularly splendid with full antlers, in the Autumn. A picnic lunch will be provided. We know the places that inspired the story of Lorna Doone, and will safely guide you over some pretty remote country, so that you can confidently enjoy this beautiful landscape. Please book via AirBnB Experiences, numbers limited to 8 guests. This tour can also be privately arranged call 01643 831759. 5th June Exmoor Park Ranger Experience, Step aboard a National Park Land Rover this summer with an Exmoor Ranger to experience a wild and hidden landscape! 6 hour experience with just 4 participants per date includes lunch and visits to hidden Exmoor. 19th June Exmoor Park Ranger Experience, Step aboard a National Park Land Rover this summer with an Exmoor Ranger to experience a wild and hidden landscape! 6 hour experience with just 4 participants per date includes lunch and visits to hidden Exmoor. 29th & 30th June Dulverton Summer Festival celebrating all things Lorna Doone. Reenactments, Lorna Doone characters, children’s activities, film on Saturday, live music and Lorna Doone banquet on Sunday. 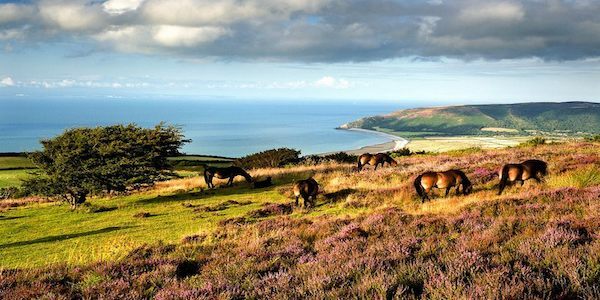 3rd & 17th July Exmoor Park Ranger Experience, Step aboard a National Park Land Rover this summer with an Exmoor Ranger to experience a wild and hidden landscape! 6 hour experience with just 4 participants per date includes lunch and visits to hidden Exmoor. 14th & 20th July Lorna Doone Walk, a walk up the Doone valley alongside the beautiful Badgeworthy water. Visit the R.D.Blackmore memorial stone and try climbing up the infamous waterslide that John Ridd scaled to meet Lorna Doone; continue through the pages of the novel, enjoying the spectacular scenery of this remote stretch of moorland. Booking essential: 01643 831759. 2nd August The Lorna Doone Experience see 6th June for details. 3rd & 4th August Vintage & Classic Weekend, RHS Rosemoor, Torrington, eclectic range of classic cars, motorcycles, tractors, machinery over in the Lady Anne’s Garden from 10am–4pm, live music. 7th & 21st August Exmoor Park Ranger Experience, Step aboard a National Park Land Rover this summer with an Exmoor Ranger to experience a wild and hidden landscape! 6 hour experience with just 4 participants per date includes lunch and visits to hidden Exmoor. 7th, 10th, 13th, 21st, 30th August Lorna Doone Walk, a walk up the Doone valley alongside the beautiful Badgeworthy water. Visit the R.D.Blackmore memorial stone and try climbing up the infamous waterslide that John Ridd scaled to meet Lorna Doone; continue through the pages of the novel, enjoying the spectacular scenery of this remote stretch of moorland. Booking essential: 01643 831759.